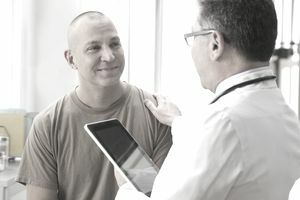 To qualify for enlistment in the US Military, you must first travel to a Military Entrance Processing Station (MEPS) and pass a medical physical. The physical starts at the recruiter's office, where you will complete a medical pre-screening form. The recruiter sends this to MEPS, where it is reviewed by a MEPS medical doctor. MEPS uses this form to determine if they need you to obtain any civilian medical records to bring with you to the physical, and/or sometimes to determine whether or not to let you take the physical at all. That's right. If you have a medical condition or a history of a medical condition which is disqualifying, and the MEPS doctor thinks the condition is such that there is no chance of a waiver, MEPS doesn't have to spend the time and money to process you for a physical. The medical folks at MEPS don't work for any individual service. Instead, they are a joint command (managed primarily by the Army), who work directly for the Department of Defense. Their job is to use published Department of Defense medical standards to determine whether or not you are medically qualified for military service. It means you don't have any disqualifying medical conditions and can be further processed for enlistment. It means you have a medical condition which is disqualifying right now but won't be, once it is resolved. An example would be a recently broken arm. This means you have a medical condition or a history of a medical condition which is disqualifying. To enlist, the service you are trying to join would have to process a medical waiver through their individual medical chain of command.